The perfect Christmas 2012 gift for everyone who enjoys life, love, laughter and good wine, this book is charmingly written by John Saker and full of delightful and imaginative full-colour illustrations by Scott Kennedy. John Saker is wine columnist for Cuisine magazine and Sunday magazine (Sunday Star Times) and author of Awa Press’s perennially popular book How to Drink a Glass of Wine, now in its fourth printing. His articles have appeared in the Listener, North & South and National Business Review, and he is a past winner of the Cathay Pacific Travel Writing Award. His book Tracing The Arc in the Montana Essay Series edited by Lloyd Jones received wide acclaim. He is also the author of The Pinot Noir Story (Random House). Scott Kennedy is a Wellington-based illustrator whose work appears in books, magazines and newspapers in New Zealand, Australia, Canada and the United States. He has created the award-winning cover illustrations for all books in Awa Press Ginger Series (13 to date). Scott’s paintings and prints are held in galleries and private collections in New Zealand and around the world. His work was chosen to celebrate the National Library’s exhibition: 100 years of the New Zealand School Journal. Vinacular is a light-hearted trip through the language of wine. Saker’s witty and sometimes poetic aphorisms are given humorous visual form by Kennedy…[a] lively little stocking filler. It is a light hearted look at some of the pomposity with which wine is described and talked about but in many cases it does provide useful information in a simple but amusing manner. This is a light, cheeky and amusingly bubbly little title. This quirky, illustrated hardback guide to wine vernacular is a nifty wee book that aspiring and established wine connoisseurs will enjoy…Vinacularwould make a great coffee table book or a gift for the wine connoisseur in your life. A brief, but delightful, treat. 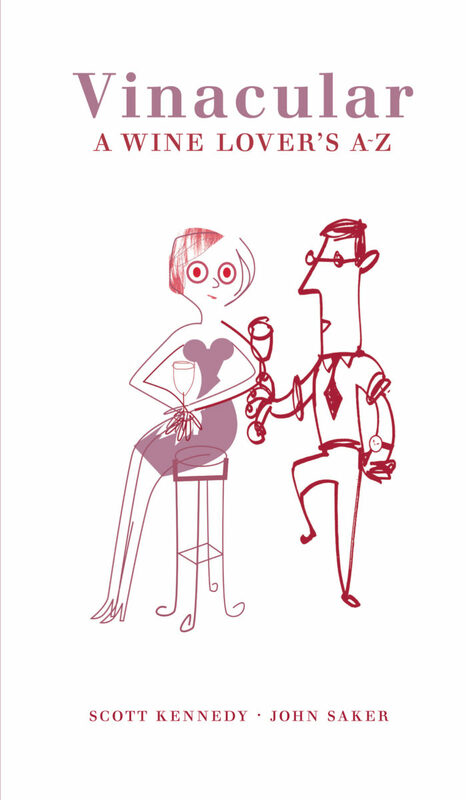 The illustrations really are quite lovely – gorgeous quirky little drawings, bold but not overpowering use of colour, that capture so succinctly equally well worded snippets of wine trivia that Mr Saker has so neatly defined for us.